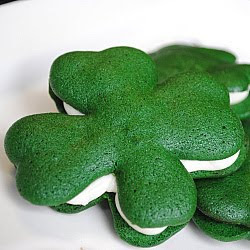 These are just red velvet cake cookies made with green food coloring instead of red. Make sure you get a separate bottle of green liquid food coloring as it takes a lot of color to get a vibrant green color. McCormick makes individual 1 ounce food coloring and its available pretty much anywhere, I found it at Walmart. I didn't need the whole bottle, green is easier to achieve than red. Just be careful when you mix these up, it can get a little messy with all the food coloring. To do the shapes, find the shape you want and trace it onto parchment paper with a Sharpie or pencil. When you draw the shapes out remember that you will want to pipe inside the lines as the cookies will spread a little. Also, you want a shape that isn't too detailed. Because of how the cookies spread, you have to over-exaggerate the detail when piping so it doesn't all just run together. You can use a Ziploc bag and just snip off the corner if you don't have a piping bag. The filling is a classic cream cheese frosting. When the cookies are cooled, you'll want to match up the shapes as well as possible and then pipe the frosting on, leaving some space around all the edges so when you sandwich the top cookie on, the filling will squeeze to the edges and not over them. Preheat oven to 375 degrees. Line baking sheet with parchment paper, with pencil side down. Beat butter and sugar in mixing bowl on medium high speed until light and fluffy, about 2-3 minutes. Add egg and beat until well incorporated. Mix in vanilla and corn syrup and beat about 30 seconds more. Combine flour, cocoa, baking powder and salt in a small mixing bowl. Add 1/3 of the mix to the batter and beat on low speed until just incorporated. Add 1/2 of the buttermilk and beat until just incorporated. Repeat with another 1/3 of the flour mix and the rest of the buttermilk and finally the last 1/3 of the flour mix. Scrape sides of the bowl as needed. Finally add food coloring, start with about 1/2 and mix until the color is uniform but do not over beat. Transfer batter to a piping bag fitting with a large round tip and pipe onto parchment paper. Bake about 8 minutes until the cookies are set. Cool about 5 minutes on the pan and then transfer to a wire rack to cool completely. Beat cream cheese and butter on medium high speed until smooth and fluffy, about 3 minutes. Add in vanilla and beat about another minute. Add powdered sugar, 1 cup at a time beating on low until incorporated. 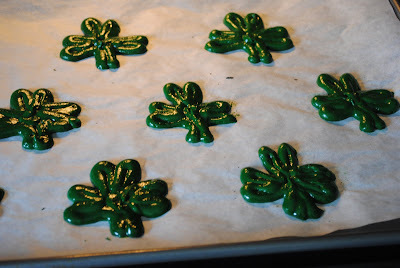 Transfer to a piping bag and pipe onto back of 1/2 the cookies. These are too cute!! Great job. These look amazing! you are awesome!!! These are so cute looking. Totally irresistible. I love these. Very creative!! Thanks all! Your comments are so sweet! Just found your blog through Baking Bites - these are SO adorable!!!! I like how your cookie turns out to look after spreading. But I am not good at drawing the shape to allow room for spreading. @hanushi - I'm sorry I dont have a template... you need to make the lines exaggerated or it will just bake into a round blob so if you are having problems being consistent I would trace the bigger shape, then draw out the exaggerated smaller shape inside it. Cut that out and trace that onto parchment paper. Maybe do a test cookie first to make sure it comes out to your liking, adjust as necessary and then bake. 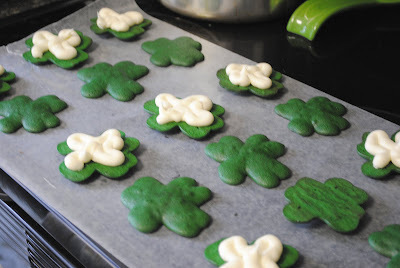 You could also do something more simple than shamrocks - they would still be cute as round cookies. oh my gosh they look so TASTY!!!!! I WANT ONE! OR TEN! You should open a business!! I'd buy these!! Great Job! Oh my god, these look amazing! My whoopie pies always come out a bit rubbish, so may give this one a go. I made these yesterday. They turned out well. 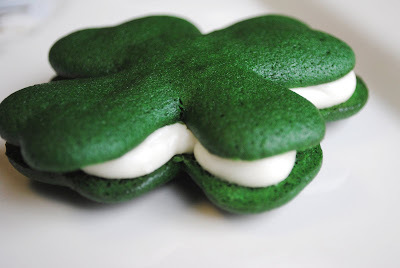 I made one sheet of shamrocks (7 sandwiches worth) and aother 5 sandwiches in a plain whoopie pie tin - they were a lot bigger. 12 sandwiches in all. I had one and it was yummy! Sent the rest to work with my husband as they all had to work an emergency today (St. Pat's Day). Thanks for the fun idea! I know what will be on my weekend schedule!! Yummy:) Thanks so much for sharing! 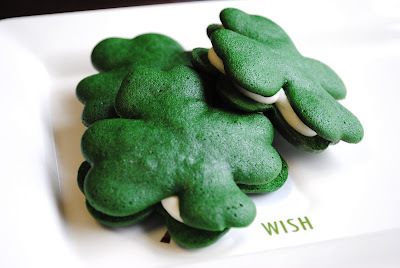 Happy Saint Patrick's Day and keep on desserting!